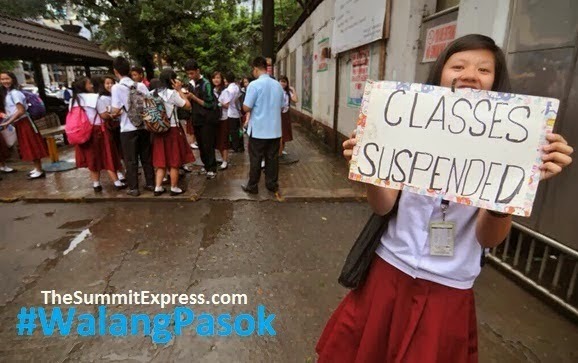 Manila, Philippines - Some local government units (LGUs) and Malacañang Palace through Executive Secretary Paquito Ochoa announced class suspensions for today, September 19, 2014 (Friday) due to inclement weather situation as Typhoon 'Mario' brings heavy rains and floods. The advisories were released through social media Friday morning. According to PAGASA on its latest update, Typhoon Mario has intensified and slowed down as it moves towards North Luzon. At 4:00 am today, Tropical Storm “MARIO” was estimated based on all available data at 212 km East of Casiguran, Aurora (16.1°N, 121.1°E). With maximum winds of 85 kph near the center and gustiness of up to 100 kph. It is forecast to move West Northwest at 22 kph. Classes in all levels, public and private, and work in government offices except those in as per Executive Secretary Paquito Ochoa, Malacañan Palace. For the private sector, the discretion to suspend work lies with the individual companies and employers. Malacañang urges employers to consider the circumstances of their employees brought about by the effects of Tropical Storm Mario.